St Hilary is a joy. Hidden away in its own churchtown, alongside a small farm and vicarage, its surroundings positively glow. Even with its unusual broached spire it is hard to find. 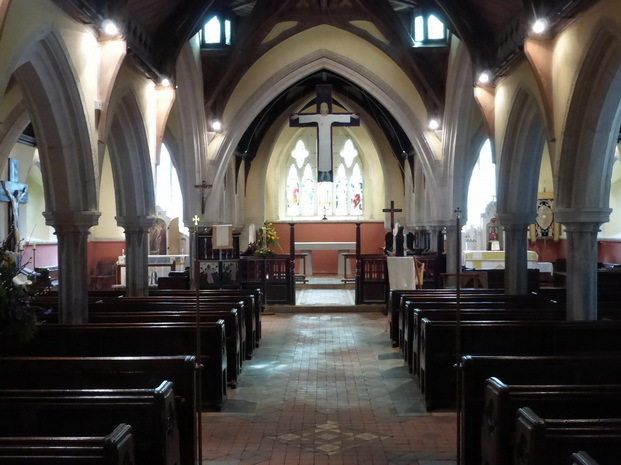 Space does not allow a full account of the story, or pictures, of the church but suffice it to say that it suffered a terrible fire and was re-built and re-opened in 1855. A charismatic Anglo-Catholic priest, Bernard Walke arrived in 1913 and stayed until 1936. He and his wife Anne became friends with the Newlyn School of artists and engaged many of them to help beautify the church. He also allowed a 11 year old Joan Manning to paint a series of pictures in the Lady Chapel. The result is a space which has a wonderful post-Arts and Crafts simple feel. Sadly, the Protestant Truth Society, who sound like the Taliban of their time, objected to many of his ‘popish’ innovations and physically attacked the church to remove some of them. Walke, who was by now famous for his radio broadcasts, survived another four years and then retired. There is a lightness to the interior, helped by the high level squint windows over the crossing. The first impression is of the elegant rood which shows a dressed Christ, arms outstretched, a motif that is echoed in the main altar cross. 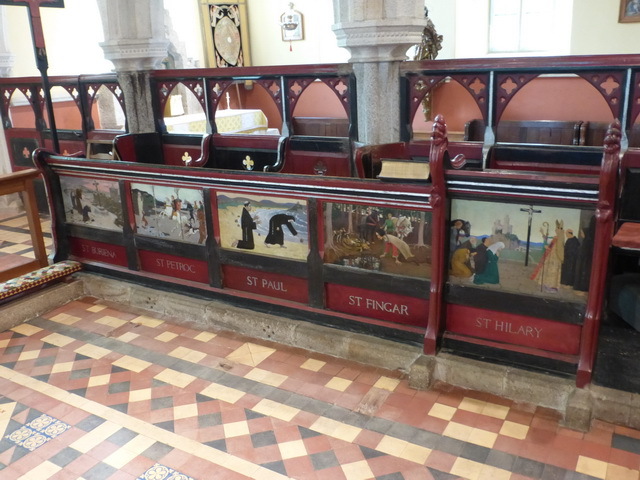 The majority of the artwork is gathered around the chancel with a series along the front of both of choir stalls and on the back of the Lady Chapel (North) parclose screen. The three altars are all granite, carved or simple. A fourth altar is being developed, unusually, at the south west corner (currently in use for leaflets). 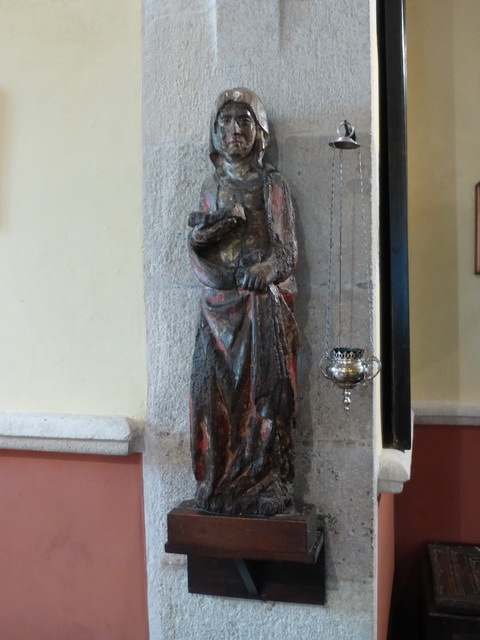 Two wooden statues, one C14 of St Anne with a remarkably modern-looking face and another C17 of St Joseph, stand in the south aisle. These were bought by Walke with money he earned from the broadcasts. The fire probably destroyed any old monuments which gives the church a general coherence and gave Walke a clean space with which to work. In a corner is an old C4 Roman milestone from the time of Emperor Constantine. Outside, the are more joys: apart from a churchyard covered in white bluebells and primroses. A post-Roman gravestone known as the Noti Noti stone (to Notus son of Notus) and several crosses or cross shafts line the route to the porch. There is also a lovely small schoolhouse on the edge of the churchyard. 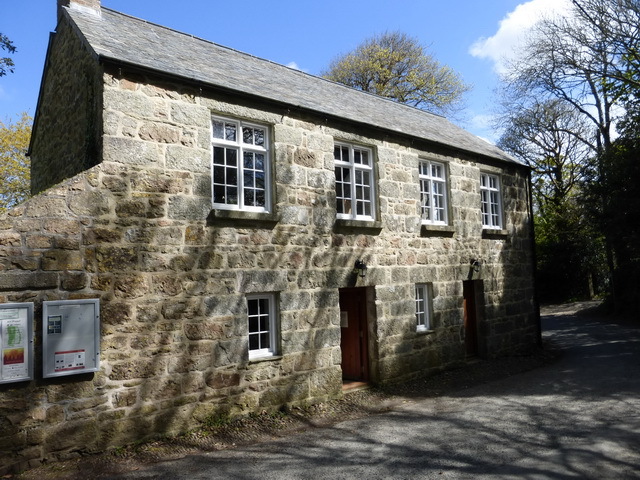 This is now a heritage centre, with the upstairs used for parish activities and events. There are similarities between this and the Poundstock gildhouse although this one is of later date. 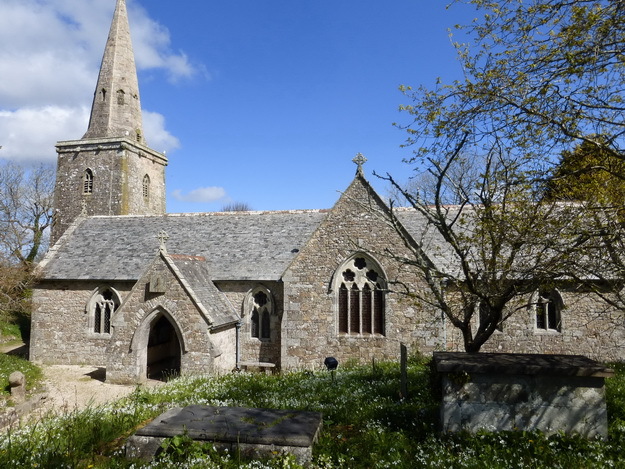 You will by now gather that we much enjoyed this church and feel that it deserves at least one, if not two, stars from Simon Jenkins for its calm simplicity. Simply enjoy the pictures below which are a mere selection.